Contraction is not in itself an original disease. It is, in most cases, the result of other diseases and of artificial living. 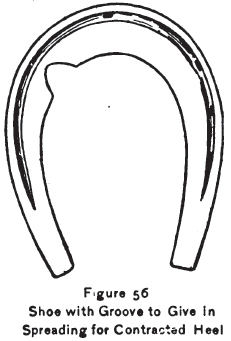 Before the colt is used for work and shod, his hoofs are large and open-heeled. The quarters are spread out wide, and the foot on the bottom is like a saucer. The reason for this is found in the fact that the colt has been running on the green an moist turf without shoes, and the feet have, in walking in mud and dampness, gathered so much moisture that they have spread at every step. This is changed when the colt is taken out of pasture, put on hard roads, and stabled in a stable with hard and dry floors, where the feet become hard and dried up. Contraction follows sprains of the tendons, corns, founder and navicular disease. When contraction is found in only one of the feet, it is generally the result of a disease in the foot, because the horse will stand on the healthy foot, which receives more pressure and is spread out, while the diseased foot is dried up and contracted. In such cases the feet become uneven and do not look like mates. No man can comprehend the suffering of a horse when his feet are hoof-bound and pressed together as if they were in a vise. The pain from a pair of tight and hard boots on a man is nothing compared to the agony endured by this noble animal and silent sufferer. Contraction seldom, if ever, affects the hind feet. This fact should be suggestive. Why do not the hind feet become contracted? Because they receive more moisture, and consequently do not dry up and become as hard as the front feet. From this fact we may conclude that there is no such thing as shoeing to cure contraction; still, if the horse must be shod in order to work, the shoeing should be done in such a manner as not to increase, but on the contrary to alleviate the trouble. Pull off the old shoes, pare down the feet as much as can safely be done, but leave the frog as large as it is. Then have the feet put in a warm poultice for twenty- four hours, or in a packing of wet clay. In preparing the foot for the shoe pare down the heels so that there will be no contact between them and the shoe, especially if the hoofs are narrower at the bottom than they are at the coronet. Next prepare an open bar shoe, as shown in Fig. 55. Nail this shoe on with the six front nails leaving the hind holes empty, and let the shoe or bars rest well on the frog. Keep the feet soft, either in packings or with hoof ointment or both, and as soon as the foot is soft it will spread from the effects of the horse standing on the frog. The shoes should be reset often, and when they are nailed, the nail should be started at the inner side of the nail hole; this will spread the hoof all that it will stand. Nothing is more undesirable than an endless bar shoe, with holes clear back to the heels, as is used by many. The foot, being nailed to it, cannot spread. It is closed in with an iron band, which renders it impossible for the foot to spread, it deadens all frog pressure and, still worse, it compels the foot to crimp, as it must grow inside of its limit downward instead of growing outward. 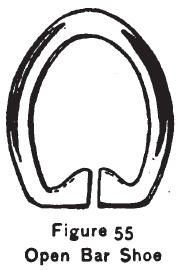 If any disease is caused by shoeing, it is contraction, for all shoes, no matter how they are made, will interfere with the expansion of the hoof and raise the foot from the ground, giving the air a chance to play under the sole and dry the foot. If calks are put on, they should be as short as possible. If the frog has become hard do not put on a bar shoe with frog pressure, for it will not do much good, but rather harm. The only remedy for contraction is moisture. The disease is brought on by artificial living, in which the foot has been deprived of the moisture necessary to keep it healthy. Bring the foot back to that natural condition in which it was originally and contraction is cured. Any packing of hoof ointment used so as to soften the foot will accomplish this. Many shoes and devices have been made to spread the feet, but nothing is more injurious. I will not spend any time trying to explain these different makes and kinds of shoes, for they are of no value but on the contrary will do great injury to the horse. We may imagine the pain to the horse by stretching the dried wall out from the sensitive laminae of the foot. This will tear asunder but not spread the foot. No, the spreading must be natural and slow. Soften the foot and the foot will spread at every step the horse takes, as the foot receives on an average a thousand pounds’ pressure in every step, and if that is not sufficient nothing else will do it. Shoes are also made with the web of the heel slanted out; the intention being that the foot shall spread from the heft of the horse as just described, and it will do so provided the foot is wider at the bottom than it is up at the coronet, and if not wider it will not spread very well. But this spreading will only bruise the sensitive laminae, if the foot is not prepared by a good soak before the shoe is put on, and kept in that condition while such shoes are used. I maintain that the frog is the best wedge to spread the foot with, if the foot is only kept in such a condition as to permit this natural foot expander to accomplish the object for which it was placed there. The best shoes for contraction are no shoes at all, but a long run in a wet pasture instead. Horses with feet predisposed to contraction should be subjected to a preventive treatment. An occasional poultice of boiled turnip, linseed meal, or the use of some good hoof ointment, will prevent the foot from crimping. When contraction is the result of some disease the treatment must be directed toward curing the disease. 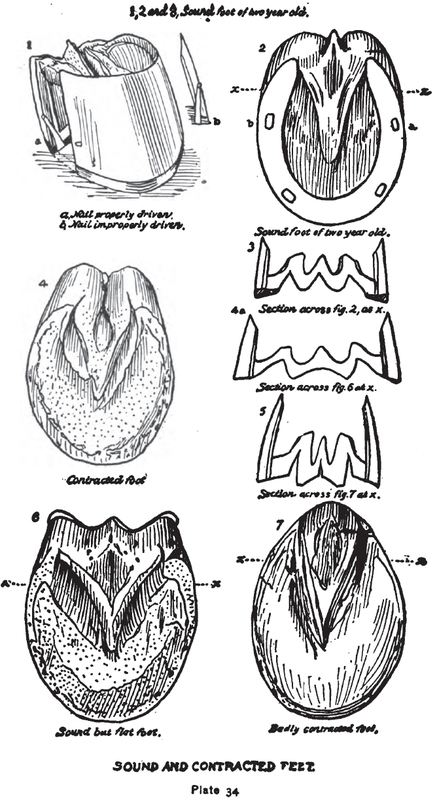 If the inside heel has been contracted so as to be bent under the foot, a shoe, as shown in Fig. 56, can be used, and the groove in the shoe should be on the same side of the foot as the heel which is contracted. This shoe can be spread a little at a time with a pair of tongs. But it should be remembered that no spreading should be done before the foot has softened. The groove in that shoe will cause the grooved side to expand. The spreading should be done with great care and very little at a time.